Air quality and the ability for it to circulate around your office is of prime importance. With airborne allergens and dust collecting in the air, it can cause issues with health and cleanliness. This can lead to employees regularly becoming ill. Follow the strategies as outlined below to improve your work space air quality and circulation. Read on to discover more or jump to a chapter by using the links listed below. It’s of vital importance for the airflow system of your building to run efficiently and smoothly. This includes being sure there’s no blockages in your ventilation system. Be sure that all vents and heating registers are not covered by furniture or are closed. The external condenser must remain unobstructed by debris or any material that may cause problems with airflow in and out of the vents. Prevent overheating and reduce strain on your A/C systems by removing items like debris, garbage, leaves and even plastic bags that may be blocking the unit. If your air conditioning unit has old and dirty air filters, it will not be able to cool correctly, raising electrical costs and limiting the units efficiency. Dust and debris naturally builds up in the ventilation system over time, so it’s imperative to clean or change the air filters regularly. Preferably every six months to no longer than a year. Poor cooling can often be down to leaks in the air ducting where cold air escapes. It’s important to have your air ducts checked and cleaned on a regular basis to ensure maximum efficiency and remove any possible build up of mould or airborne pathogens. Any holes or cracks that are discovered can be repaired, or new ducting can be installed. The condenser coil is a critical part of your airflow unit. It must be cleaned regularly as debris, dust and grime can build up over time, which impacts it’s ability to transfer heat correctly. If the coils aren’t managed properly, your system will struggle with the burden of circulating air leading to poor efficiency, increase bills and expensive repair bills caused by component failure. It’s very common for fans and blower motors to become coated in dirt, debris, dust and grime over long periods of time. This will reduce their speed and performance. When your A/C system is failing to produce cold air, one of the most common causes is low freon gas levels in the system. If your office temperatures feel unusually warm all the time, have your coolant levels checked to ensure their sufficient gas left to create cold air. Other causes could be a coolant leak where cold air is escaping through a faulty condenser. Be sure to check all thermostats and systems that regulate the temperature of your building. They may need to be replaced or changed to maximise available air flow and temperatures. An incorrectly sized air conditioning unit whether large or small, can produce poor quality air. It’s not uncommon for some units to actually be too large for the area they are intended. Having an oversized cooling unit can cause issues with comfort, as they fail to remove sufficient moisture from the air as they run for too short periods. This can lead to discomfort due to excess humidity remaining present. In order to remove stuffy air and improve air circulation, you may have to reconfigure and reinstall new air duct system so they meet the demands of the office. Some older systems may have been designed for different needs and could require updating to improve circulation for more modern A/C units. When dehumidifiers and air conditioners are used, it’s a good idea to keep your buildings humidity levels between 30 and 50 percent to prevent mould, dust mites and allergens from developing. When liquids are spilled and left unattended, they can promote the build up of mildew, mould and allergens. Cleaning up any spills quickly can dramatically reduce the chances of these problems from developing. Try adding some naturally oxygenating plants that help to purify air and remove toxins. They’ll add a nice organic touch to the office and remove many unpleasant airborne pollutants. There’s many to choose from including dracaenas, aloe vera, bamboo, snake plants, peace lilies and spider plants. Where possible, fresh air should be used as it’s commonly known for its health benefits. Opening windows and doors will pull in fresh air and circulate around the office environment, removing stale air. Maintaining a clean office is vital to ensuring a fresh and healthy environment. Tasks such as vacuuming, sanitising, dusting, clearing out clutter and disposing of waste should be done under a regular cleaning and maintenance schedule. Hiring a professional cleaning company to clean your office daily is the quickest and simplest way to achieving this. Did you know air quality and air flow is crucial to maintaining a cool and healthy office environment? 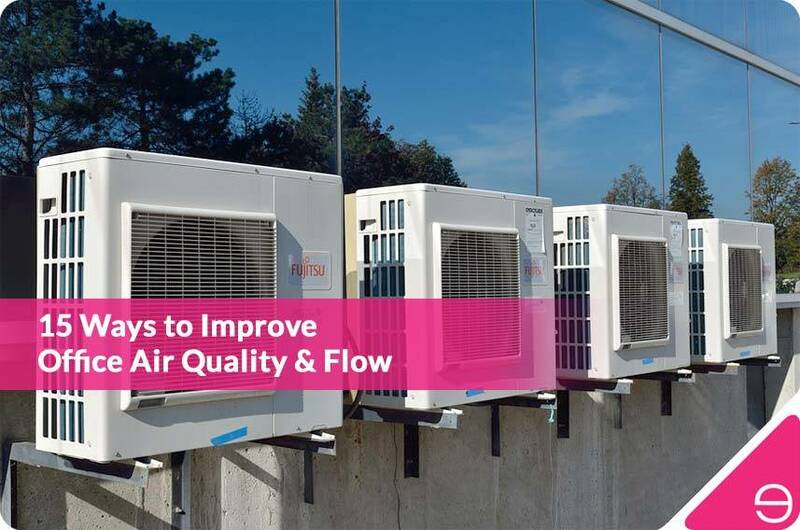 Read our blog to learn 15 ways to improve air flow and quality.